I had a lot of fun drawing this. 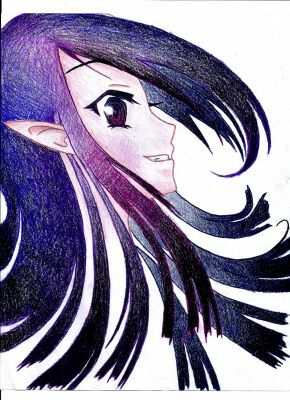 I used prismacolor colored pencils for everything. Sorry about the white spaces. The table was textured. Ooh, prettiful. XD. I like the way you did the hair, ears, and shading. For once, Opal is /happy/. o.O Great job. she looks triumphant. her grin has a michevious glint to it. I love it! I myself am awful with colour. I like how her skin is slightly purple, but it somehow seems right. ooooooo...very good piccy but shouldnt opal look evil-er?